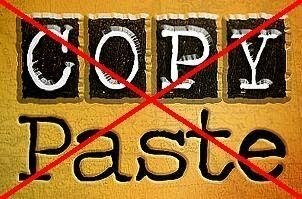 Plagiarism is a common reality these days especially in online weblogs. Reports have shown that there are hundreds of thousands of different blogs that work solely on plagiarized content. There are these certain content thieves that target quality articles and mindlessly post the entire thing word to word, on their own amateur blogs. Seeing someone else getting full credit of something you wasted your precious time on is no doubt frustrating and annoying but is also quite illegal. Rewriting however, by explaining something in your own words and/or providing backlinks to the original source is still somehow acceptable as it vouches for the sharing of information which would pretty much stay at a single corner of the world otherwise. Step 1: Open up the Blogger Dashboard for your blog. Step 2: Click on Layout from the left panel. Step 3: Now click on Add a Gadget wherever available. 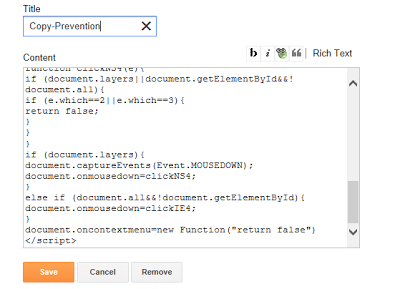 Step 5: Enter a title for the gadget in the Title field and the following code in the Content field and click the orange Save Button. Code Sources: DynamicDrive and BloggingeHow. Blogger will give you a notification confirming the saving of the script. Step 6: Open up your blog and try copying the text or saving the imagesJ. You’re done, your blog is now copy-proof. Very desperate thieves can still however copy your content by taking screenshots and then writing from them, but I’m sure they’ll come to a good realization while doing that and will stop it further since it isn't that simple of a task.